PHOTO BY JACOB WALSH The Rev. Lewis Stewart, center, called for the release of video footage from a police body camera, following the alleged assault of a Rochester man. Will a video from a police officer's body camera mark the turning point for reforming police oversight in Rochester? Complaints about police misconduct are currently handled almost entirely by the police department, with little outside oversight and little transparency. Community activists and some elected officials have pushed for decades for civilian involvement in police oversight and for public release of information about how complaints are resolved. But the reforms have been minimal. 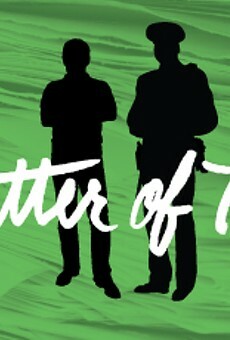 The police department investigates all complaints about police conduct, and the police chief determines whether the complaints are justified and what discipline, if any, results. State law and union contracts protect officers' personnel records, so the public seldom learns the result of the investigations. 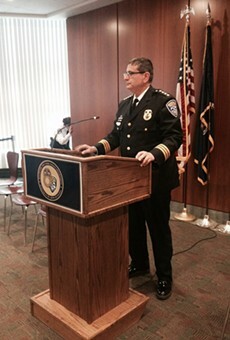 Two years ago, however, Rochester police officers began wearing body cameras. And one of them was in use in early May, when two officers stopped and questioned Rochester resident Christopher Pate, who is African American, during a crime investigation. Pate says that even though he showed the officers identification proving he was not the man they were seeking, the officers tased and assaulted him, injuring him severely enough that he required medical treatment. Pate filed a complaint and says he plans to pursue a lawsuit. The two officers have already been suspended without pay, and the RPD is continuing to investigate the incident. At a press conference last week, Mayor Lovely Warren and Police Chief Michael Ciminelli, who have seen the body-camera video, said they have asked District Attorney Sandra Doorley to review the officers' conduct. Ciminelli said he believes their actions "may very well rise to the level of criminal prosecution." Doorley will review Pate's complaint, information from the RPD's investigation, and the video, and will decide whether to pursue criminal charges. The case could put her in a difficult spot, since district attorneys rely heavily on police officers' investigations and testimony to build and win criminal cases. In addition, the district attorney is an elected position, and in their campaigns, many DA's tout their record of successful prosecutions. Doorley will be up for re-election next year, and a controversial criminal case against police officers could become an issue. 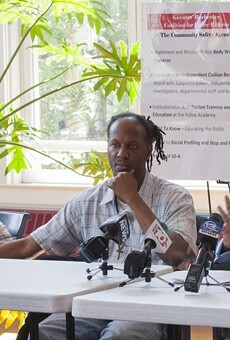 Pate isn't the first person to accuse Rochester police officers of excessive use of force, and in fact, late last week, the Democrat and Chronicle reported that the officers in the Pate complaint have been named in excessive-force complaints in several other cases. At a press conference last week, the Rev. 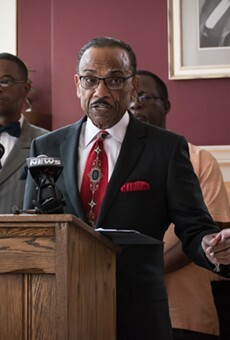 Lewis Stewart, a long-time civil-rights activist, said the video footage makes it hard to dispute what happened, and he called for public release of the body-camera video. A press release from the city last week said that the RPD would release the video "and all public documents related to the incident once it is legally appropriate to do so." But police officers may insist that under state law and their union contract, those documents can't become public unless the Pate case becomes a criminal matter. Stewart said Pate's case highlights the need to look at police culture, the training of new officers, and what the RPD has done to dismiss officers guilty of misconduct. Pate's case also puts pressure on City Council, which has been reviewing Rochester's police oversight system for months. Council President Loretta Scott had hoped to have a proposal for reforming the system ready for a vote this past spring, but it's been delayed as city officials tried to find a way to make substantive reforms that won't violate state law.